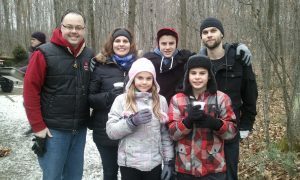 The Currans celebrate the holidays in 2012 while hunting for a Christmas tree. Emerson is picture on right. In a blink of an eye, Mike Curran’s family was thrown into a state of crisis after the sudden death of his oldest son Emerson, who suffered a massive brain injury after being badly beaten at a house party in August 2013. “We were absolutely broken. My friend Mark Sutcliffe recommended that I call Roger Neilson House. From the very first phone conversation, I knew this was the right place for us to be,” says Curran, the co-owner of the Ottawa Business Journal and president of Great River Media. Over the next four months, Curran, and his wife, Catrina Curran, met with Carol Chevalier, a social worker at Roger Neilson House, for counselling and later attended group therapy. The couple’s other two sons, Graeme and Liam, and daughter, Lauren, attended bereavement sessions for siblings with recreational therapist Kat Brooks. Curran struggled with a loss of identity and realized through counselling that this was one situation a father could not fix. Emerson had attended a party in Yellowknife the night before he was due to travel home after a summer spent working there for an airline company. He was airlifted to an Edmonton hospital in critical condition and passed away a few days later. A Yellowknife man was sentenced to five years in prison for his crime. A few months after Emerson’s passing, Mike Curran penned a powerful and heartbreaking newspaper column in tribute to his son, his decision to become an organ donor and the importance of joining the registry. He recounted sitting by Emerson’s bedside in intensive care as organ donor nurses began the painstaking task of finding recipients. Catrina Curran says after Mike’s column ran in the Toronto Star, they received wonderful letters from people sending love and support. Mike Curran credits the seven months or so that his family attended therapy at Roger Neilson House with helping them cope with their grief. He admits that attending group therapy and listening to other people’s stories was at times excruciating and overwhelming. While the sessions left the Currans emotionally and physically exhausted, there was comfort in knowing that they weren’t alone. “In one of our sessions, they brought in a couple who tried – with some effectiveness – to tell us that even though things were horrible right now, there would eventually be joy in our lives and that we would live through it,” says Mike. Megan Wright, executive director of Roger Neilson House, says losing a child at any age is a profound, life-altering experience. The death of a loved one to an act of violence is traumatic and impossible to prepare for. She says it is important for any family dealing with loss to have the opportunity to attend counselling in order to connect with a community who understands. Programs, like bereavement, are funded through the generous support of donors and the Ottawa community. “We would not be able to provide the breadth of the services we do without them,” Wright says. “Roger Neilson House offers a safe, supportive space for those suffering the loss of a loved one through individual and group counselling. We offer bereavement services for anyone in the whole city. We also offer education and support to prenatal groups, siblings and grandparents. Our group sessions run over nine weeks and are facilitated by a social worker,” Wright says. The Currans have returned to Roger Neilson House to offer the same kind of support to families that they first received in group therapy. Catrina, who is on leave from her job in business development, is the volunteer lead at KIDSFEST Ottawa, an annual parent and child consumer show produced by Great River Media and held in March at EY Centre. A big part of her motivation in working at the event is to help raise funds for Roger Neilson House through a charity raffle. Catrina praised the staff at the palliative-care facility located on the grounds of the Children’s Hospital of Eastern Ontario for the comfort and stability they offered in the days after Emerson’s death. Catrina says the staff offered her a lifeline and sage advice on navigating the trauma for her other three children. “Our children were at critical ages – 18, 13, 11. Each child handled their grief in a different way. The sibling grief counselling was helpful and gave them a chance to express their feelings, to talk about Emerson and to honour their sibling,” she says. “I knew that there was always someone at Roger Neilson House who cared and I could connect with when I called, emailed or went in person. It was a fantastic resource for me. There is a real sense of community,” Catrina says. Joan and Bruce Duncan attended a six-week session for grandparents after their grandson Craig Duncan, 17, was killed in a motor vehicle crash in January 2017. An Ottawa man has been charged with negligence, impaired driving after the fatal collision. Craig’s parents, David and Jennifer, and younger brother, Neil, also sought counselling at Roger Neilson House. Duncan says weekly handouts were a helpful resource and topics included common reactions to grief and loss, physical symptoms and troubling emotions and sleep and energy disruptions. Guest speakers were also brought in and helped identify the various feelings individuals face in times like this. One piece of advice that resonated with Duncan was making subtle changes to family gatherings in order to make them bearable. For more information about grief support or bereavement care, contact 613-523-6300, ext. 622 or 607.